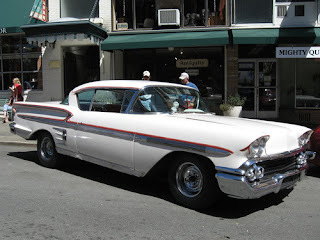 George Lucas wanted a car that would evoke circa 1962 memories of the cruising he experienced growing up near Modesto. He and movie producer Gary Kurtz whittled a list of potential car candidates down to a red, full-fendered coupe, finally basing their selection on its chopped top. Henry Travers, the film’s transportation manager, was given the enviable task of overseeing the coupe’s reconstruction as a bona fide hot rod. Henry trailered the car to Bob Hamilton’s shop in Ignacio for the conversion. Lucas wanted a highboy with bobbed rear fenders to emphasize the fender laws that hot rodders continually confronted more than 50 years ago. Reconstruction included the addition of motorcycle front fenders, aluminum headlight stanchions, and chrome plating for the dropped I-beam solid axle. Also, the grill and shell were sectioned a few inches. Next, it was trailered to Close Orlandi’s Body & Fender in San Rafael for its coat of Canary Yellow lacquer paint. The interior, which was red and white tuck and roll Naugahyde, was dyed black. Johnny Franklin’s Mufflers in Santa Rosa added the Man-A-Fre intake manifold, a quartet of Rochester 2GC two-barrel carbs, and no name valve covers to the 1966 327 Chevy motor with fuelie heads. Franklin’s also built and installed the Sprint racecar-style header-exhaust system based on dimensions provided by Mr. Lucas. The remainder of drive train included a Super T-10 four-speed and 4:11 gears in a ‘57 Chevy rear end. You can still see the holes in the frame for the special removable platforms used by the camera crew for close-up filming of the street cruising scenes. The prop department made the THX 138 license plate as a play on the THX 1138 science fiction film made by George Lucas while in film school at USC in Los Angeles. This letter-and-number combination was also used on a jeep in a scene (along with Mr. Lucas) in Francis Coppola’s 1979 movie Apocalypse Now. Prior to More American Graffiti (1979), the Coupe went back to Orlandi’s shop for a new paint job; same color but acrylic enamel replaced the lacquer. 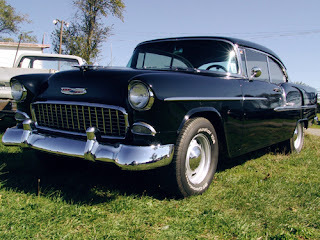 previously acquired the movie’s black ‘55 Chevy. In 1985, Rick Figari purchased the Coupe. 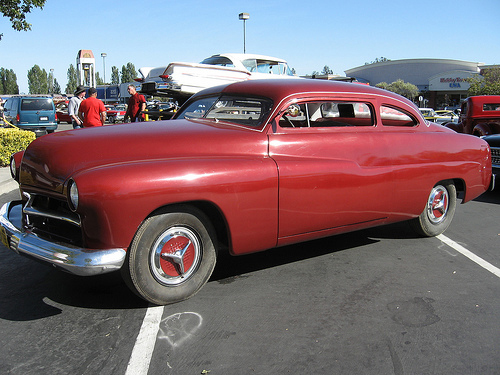 Rick then entrusted the Coupe to Roy Brizio’s shop in South San Francisco to make it road worthy again. Work included rewiring and rebuilding the T-10 four-speed, aluminizing the chrome headers, and making stronger front fender brackets. The 327 was also rebuilt. A funny note about the coupe: After the film was finished, they tried to sell it and couldn’t get the asking price of $1,500. 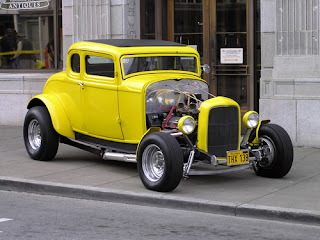 Today, both the '32 Ford Coupe and a clone of the '55 Chevy are owned by San Francisco resident Rick Figari. The stunt car for both movies, which was used in American Graffiti’s drag race scenes, had a 454 motor, TH 400 automatic and unknown Olds rear-end. The third car, used for the explosion after the drag race rollover, was a non-running salvage yard ’55 Bel Air 2-door hardtop with a wood post installed in the "B" post area by Henry. Henry drove both the deuce and the ’55 Chevy in many scenes. Having grayish colored hair, he recalls having the make-up department spray his hair black each time he drove in a scene. “I raced that ’55 down Petaluma Boulevard in the first drag race scene where Falfa and Milner go off at the traffic light”, recounts Henry. “I also drove the coupe in the final drag race on Paradise Road.” The ‘55 wouldn’t roll over as part of the grand finale crash and had to be physically rolled on its side by the film crew. After the movie, George Lucas gave both Chevys to Henry Travers as a thank you. (Henry was also in charge of selling the Deuce and Impala.) The ’55 stunt double ended up in a wrecking yard and was crushed. Despite the fact that his father warned him to keep all of the cars, Henry parted out the stunt car and eventually sold the remaining ’55 to Sam Crawford who later sold it to Steve Fitch of Wichita, Kansas. Fitch ended up selling the Chevy to its current owner, Wayne Newsome in Maryland where it is today. As a teenager, about 35 years ago, I was ready to buy my first car. I didn’t have much money so I looked at a few wrecks and in several car lots. Then, while reading the San Francisco Chronicle, I ran across an ad in the classifieds about a special sale of some movie cars. I called the phone number listed and spoke to Henry Travers, the film’s transportation manager. The next day I went to the bank and emptied my account. Then my dad and I drove to Sonoma where I met Mr. & Mrs. Travers, who were both super nice to me. After looking at all of the cars, I decided on the Impala and despite the fact that I was able to get Henry to reduce the price a little, I still didn’t have enough money and had to borrow $10 from dad. I remember Henry laughed at me because I wasn’t used to driving a stick. On the way home, the engine overheated and one of the Cadillac taillights fell off, so I had to turn around and go get it. I drove it every day to and from school. Shortly after graduating, I enlisted in the Marine Corps, so the Impala ended up parked for quite some time while I was away serving my Country. I feel so fortunate to have chanced on that ad and have enough money to buy this now legendary car. Over the years, many friends have helped with repairs. Fixing the drive train was my daughter Ashley’s senior project. My son, Matt, and Ashley helped move the car from Northern California to Colville, Washington. Matt worked for days cleaning it and my wife Sandra has always helped, also. It’s still pretty much as it was in the movie. 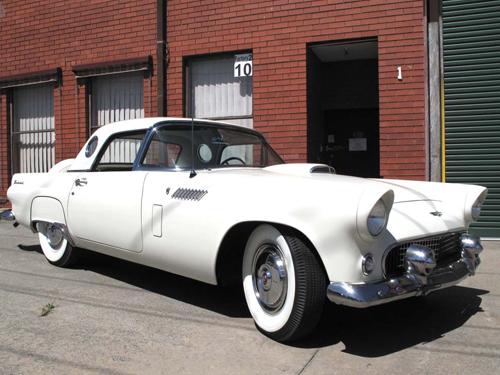 Clay and May Daily purchased their '56 Thunderbird convertible in 1964 from a San Bernardino, California Ford dealer’s used car lot. It was red and had 55,000 miles on the odometer. Several years later they moved to Petaluma and had it painted white. Ironically, they lived on Joan Drive, only about four houses away from Cruisin’ The Boulevard Board Member John Furrer who at the time, of course, wasn’t acquainted with them. 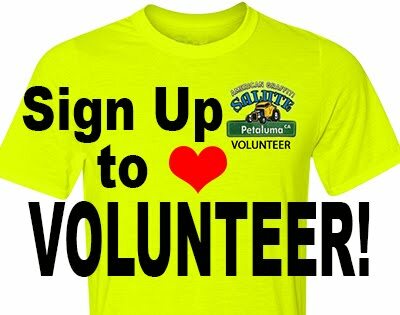 In 1972, May was downtown Petaluma doing some shopping and when she returned to the car there was a piece of a brown paper bag under one of the wiper blades. Written on it was an invitation to have the car be included in the filming of a movie. They thought it was just someone playing a prank, but called the listed phone anyway. Of course, it turned out to be Lucas Films and the rest is history. Since most of the filming was done at night, they were able to watch the action. In 1999, the Dailys and the T-Bird were invited to appear on the the Leeza television show, hosted by Leeza Gibbons. It was a surprise reunion for Suzanne Somers who was appearing as a guest celebrity. At the appropriate time, Leeza had Clay and May, who were seated in the audience, stand up and then asked Suzanne if she recognized them. Of course, after almost 30 years she didn’t, yet when Leeza told Suzanne that they knew her she was befuddled. For the surprise, everyone went outside into the studio parking lot where Suzanne's husband drove up in the T-Bird! Update: For many years Clay and May have been bringing their T-Bird to Petaluma each May to help celebrate Petaluma’s Salute to American Graffiti. When they finally said it was time to say goodbye to their baby, they entrusted their baby to a good friend who lives in Petaluma. They told us that it was their desire to have the car come back to Petaluma. 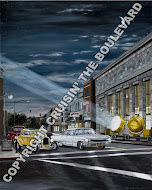 Created & Owned by Cruisin’ The Boulevard, Inc.
We don't remember when the idea to build an American Graffiti Cop Car and recreate the destruction scene came up or whose idea it was, but we do remember discussing it with Henry Travers before he passed away in August 2006. He was responsible for that scene so he was especially looking forward to helping set it up. Right after Salute 2007, we decided that 2008 would be the year and started planning immediately because we would need permits, insurance and, of course, the car. First stop was the Petaluma Police Department to make sure they didn't think we'd gone off the deep end, they liked it! We chose 4:30am on Thursday, May 15, 2008 as the date and time for several reasons: 1) It would have minimal impact on traffic, 2) The original scene was also filmed in the early morning hours. Of course the location would be the same empty lot between the McNear and LanMart buildings where George Lucas originally filmed it. 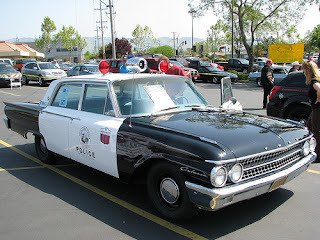 Next came the car, a 1961 Ford Galaxie 4 door sedan sporting a 272 V8 motor that we found on Craigslist and purchased on July 26 from a private party in Sacramento. After trailering it back to Petaluma and with the help of many friends and local businesses, we spent the next seven months getting it running and transforming it into our American Graffiti Cop Car. And yet by the time we got it all together, it was just too pretty to destroy, so a second search was on to find what we call “a movie car”, one that looked good from 20 feet away. We found that one, a 1961 Fairlane (a model that is nearly identical to the Galaxie) at Gerdes Auto Wrecking in Cloverdale. 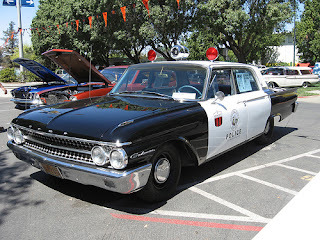 Now if you want to read all about the cars and the Cop Car Destruction scene, please visit www.standbyforjustice.com. The Cop Car is a real attention grabber wherever we take it, yet on one very special occasion, its B & M Super Chief siren became a focal point. In August, 2008 our board of directors was invited to tour George Lucas’ Skywalker Ranch located in the rolling hills of northern Marin County, so of course we brought along our Cop Car. After touring the archives where the public never gets to go (and which was absolutely fabulous), we were having lunch at the main house when a member of the Lucas Sound staff who was dining at one of the other tables asked if anyone in the room owned the cop car parked out in front. Immediately a dozen or so hands shot up! “Does that siren work?” he asked. “Like a screaming banshee”, we responded. Well, they wanted to record it as they didn’t have a period-correct siren sound in their library. So for the next 45 minutes, our board President John drove the car up and down a road with siren blaring, after which we got a tour of the Lucas Sound studio, another truly amazing place. Our Cop Car is available for rent, so if you’re looking for something unusual to have at your private party or company function, click here to find out more. Thanks to Steve Rowan of Ontario, Canada and Rick Blevins of Overland Park, Kansas, we have been able to piece together information about what happened to the Merc after filming was completed in 1972. The car was returned to Universal Studios where it sat on a back lot until it was purchased by Dave Lee Roth of Van Halen fame who eventually sold it to rockabilly band Stray Cats leader Brian Setzer. Setzer is quoted as saying, “I had to sell that car for a really embarrassing price; it was a pile of junk.” If he only knew! From here, the story gets a bit hazy, but from what we know it was purchased by a young man in New York state. He may have got it directly from Setzer or there may have been one or more other owners in between. It is reported that the New York owner, after being dumped by his girlfriend, committed suicide while in the car! The owner’s father claims that is untrue, but apparently the blood stains are there. The father refuses to sell the car, opting to let it rot away in his storage/junk yard. The first photo is one taken during Setzer’s ownership. The othertwo are from the lot in New York. What a shame to see such an icon waste away! 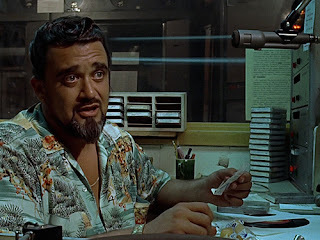 American Graffiti was Wolfman Jack’s first movie appearance and in 1991 he wrote an article for Street Rodder Magazine about the film, which is summarized below. They built the Ford coupe mainly so that it would look good in front of the cameras. That meant there were parts of it that didn’t have to be put together perfectly. Well, there was nothing in the script that called for any shots of the undercarriage of a yellow coupe, so there was nothing special done to it. Same went for the interior. I wish I could have seen Harrison Ford’s ‘55 Chevy. At first I got all confused about the car. Since none of us knew Harrison Ford back then, I mean, he was as new to audiences as to me or to anyone else in the film. I kept wondering if the car was Harrison Ford’s ‘55 Chevy or Harrison Chevy’s ‘55 Ford. Anyway, Harrison played, you’ll remember, a guy called Big Bob Falfa and he drove a ‘55 Chevy that crashed in the film. Well, that ‘55 Chevy had a stunt-double. So did Harrison Ford, else you may never have seen him as Indiana Jones in his later films. “And baby, keep your tail-lights blinkin’, and rev your engine every chance you get, ‘cause da Wolfman is always here to fill your tank and make your hood feel goooooooood. Awwwww-wowowowooooooooooooooooooooo!